The speaker of Russia’s lower house of parliament believes that there are good prospects for the development of bilateral relations with Japan. The nuclear bombings of Hiroshima and Nagasaki at the end of World War II were “a crime against humanity, which still has not been correctly assessed,” Sergei Naryshkin, speaker of the Russian lower of parliament said at the third annual Russian–Japanese Forum on Cooperation in Business, Technology and Culture in Tokyo. “Many funeral and memorial events will be held in Japan in the beginning of August, which would be 70 years after these barbaric and inhumane bombings took place. We in Russia will grieve along with our Japanese friends,” he added. The atomic bombs dropped by the United States on the Japanese cities of Hiroshima and Nagasaki claimed the lives of at least 130,000 people. The bombings were the only time in the history of warfare that nuclear weapons were used. 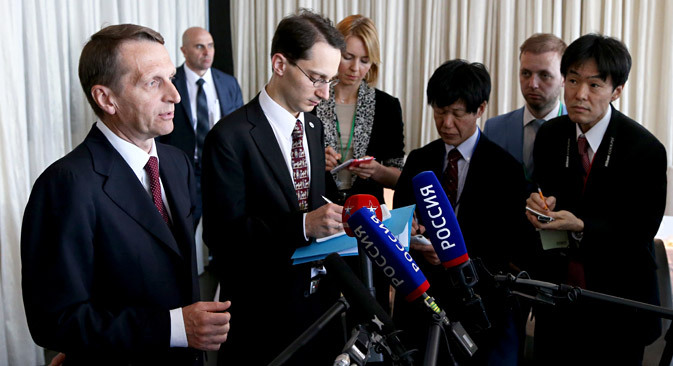 Naryshkin dedicated his speech at the forum, organized by Russian daily Rossiyskaya Gazeta and Japanese newspaper Mainichi, to Russian-Japanese relations. He called 2014 “an extremely difficult” year for Russia-Japan ties. Naryshkin also said that “the multifaceted bilateral interaction between the countries” is based on “a constant dialogue between our leaders,” implying that Moscow is preparing Vladimir Putin's visit to Japan, yet is waiting for “Tokyo to determine its agenda.” Putin feels "the ball is in Japan's court now,” Naryshkin added. The Japanese government has invited Putin to Tokyo and expressed hope of concluding a peace treaty with Russia, which has never been signed after World War II, over the question of the Southern Kuril Islands. “We would like to sign a peace treaty, thus solving the territorial dispute," said Vice-President of Japan's Liberal Democratic Party and former Foreign Minister Masahiko Komura in a meeting with Naryshkin on May 20. “And for this we would like President Putin to come to Japan. Prime Minister Shinzo Abe is seriously considering this." Japan claims the Southern Kurils chain, which it calls the “Northern Territories.” The chain comprises of the islands of Kunashir, Iturup, Shikotan and the Habomai archipelago. In previous attempts to solve the dispute, Russia has offered the Habomai archipelago and Shikotan, but Japan has refused to compromise on its claims of all the islands. The territorial claims remain an emotive issue in Japan, where former residents of the islands still harbor hopes of resettlement. Tokyo has repeatedly stated that it would offer Japanese citizenship to the Russian residents of Kunashir and Iturup, the most populated islands of the Southern Kurils.